Chain electric saw wide usepopular among owners of country farms. Although she is not able to fully replace its "sister" to the internal combustion engine, but in small volumes of sawmill work better options to be found. The tool is easy to maintain: To get started, just need to connect it to the network. 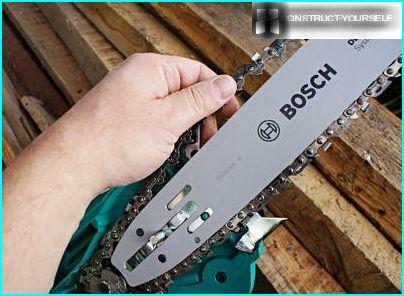 How to choose a power saw chain having a sufficient set of features, but do not overpay too much? 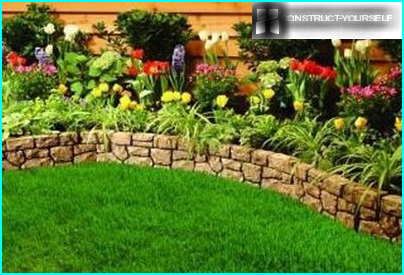 To make the right choice you need to consider a number of factors, the main of which we consider in the article. How not to break freshly bought an instrument? Saw - the right tool for the farm, which is often used in the circumcision of branches in the garden, sawing firewood and carpentry. Originally hand chainsaws were fairlybulky and heavy. 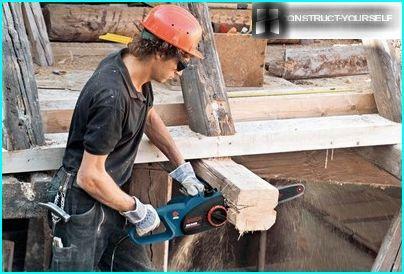 It is not surprising that the emergence of electric chain saws on the market among the majority of consumers was met with enthusiasm. In addition to ease of use, the power tool is a significant advantage that it is environmentally friendly, as in the process does not emit exhaust gases. This is especially important when cutting materials in a confined space. oil pump with oil reservoir. When the unit creates the enginerotational movement, which through a bevel gear or direct drive is transmitted to the sprocket. Housed in a common plane with a chain sprocket begins to rotate, so that the saw blade sawing wood is easy. In recent years, many manufacturers equip models of centrifugal clutch, thus preventing breakage during the cycling of the motor and blade gear. Located in a special chain oil tankby pumping the pump is supplied to the bus, which extends through a chain and sprockets for cutting the web. Many models have a lubrication intensity adjustment function, which allows you to work with materials of different hardness. The amount of the average capacity of 120-200 ml. This volume is sufficient for 2 hours of continuous operation. The task of the operator to control the oil level in the reservoir, or by working "dry" engine will quickly overheat and the tool will fail. To facilitate fluid volume control problems in the housing manufacturers make transparent inserts or provide for a special probe. 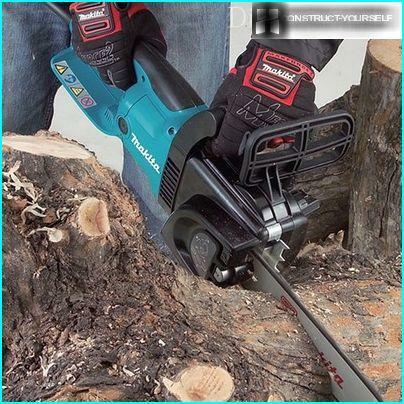 As with any power tool, chain electric sawpresent on the market for household and professional models. Professional tools are more power, allowing them to operate non-stop for a longer time. It is better to choose with the need for frequent use. 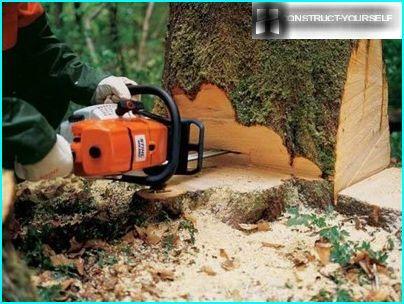 The only downside of professional chainsaws is their high price, which is often several times higher in comparison with domestic analogues. Domestic chain saws are longerfor short-term work. continuous operation, time is limited to 10-15 minutes, after which it is necessary to pause, allowing the engine to "relax." In order not to miscalculate, before choosing chainelectric saw, determine for themselves the amount of the proposed operation and the frequency of use of the unit. If you need a tool for seasonal work in the country, it is possible to restrict domestic goals. The modern market offers a wide range ofmodels. 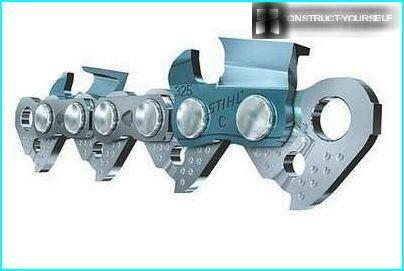 Among the famous brands of proven most popular manufacturers are: Bosch, Sparky, Patriot ... There are also less untwisted brand, which often do not yield to the presented functions. Therefore, the choice of chain saws should be guided not only razreklamirovannost brand, but also the performance of a particular model. The first thing to look for when selecting a tool - motor power. This parameter depends not only performance but also durability. If the voltage jumps in your poweroccurs frequently, choose the best tools with sufficient power. The engine is the chain-saws with an undervoltage will not overheat, posing a nominal capacity. When an unstable voltage specialistsIt recommends choosing a model equipped with a thermal control system that automatically shut off the instrument. Thermostat works when the motor winding temperature reaches a certain threshold. But it is necessary to take into account that a too frequent disconnection under unstable voltage is reduced and the performance of the unit. The cross - axis motor isperpendicular to the width of the unit, and its center of gravity a little biased. When working with this tool will always have to maintain a balance. Maximum comfortable working with him in the vertical plane, when you perform a cut from top to bottom. Longitudinal - design is aa straight line, in which all the components are well balanced. This design provides excellent cornering balance under canvas, giving the instrument more maneuverability. Saws with a transverse engine layout designed for general use. The power of these tools varies 2kW area and weight does not exceed 4 kg. 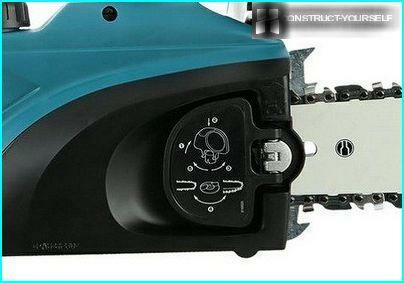 Saws with a longitudinal engine layout are indispensable for joinery. From the considerable weight of the hands will get tired quickly, so with such a tool is not very convenient to be operated for a few hours of continuous operation - it is worth considering. When making use power sawslow-profile chain. Though they have a lower performance, but good that the tool is subjected to less vibration, making it safer to use. Classical - chain tensioner securing tiresscrews and relax with a flat screwdriver to gently shift. 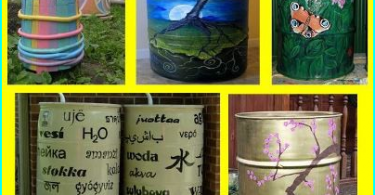 This is a fairly laborious process time-consuming and requires the availability of the necessary tools at hand. Simplified - tension the chain sought by loosening nuts and bias tires through the slider. Grease the saw unit in the current modelsby using the oil pump automatically. The pump is driven simultaneously with the inclusion of a saw. This greatly simplifies the maintenance of the unit. Owner Problem drinking - to control the level of liquid oil and pour it on as needed. Working tire, on which the chain is fixed, canhave various modifications. The length of the bus is directly connected to the power tool. It can reach 30 to 45 cm. Given that country site is unlikely to have to cut thick logs, the best option for chores considered bus length of 40 cm. Tools with a greater length of the bus will be much harder, more powerful and therefore more expensive. The quality of the cut depends on the thickness of the cutting blade. 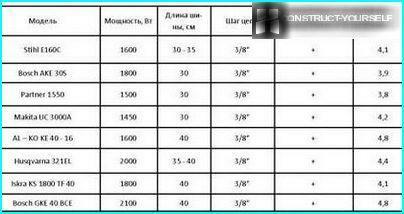 On saws different depending on manufacturersInstrument performance can be set different types of tires and chains. Over time, the movable elements will wear out and require replacement. Therefore, in order to prevent further problems finding parts, power tools, choose the most common type of circuit. Start the engine and braking systems - perhapsthe most extreme operating conditions of the unit. The reason for this is that in these moments pass through the motor winding current dose of shock, which significantly reduce its resources. Softstarter extend the "life" of the unit. The presence of inertial brake allows for a fraction of a second to stop the motor when power is turned off, thereby reducing power consumption. Any electric saw for woodworking is a potentially dangerous tool. 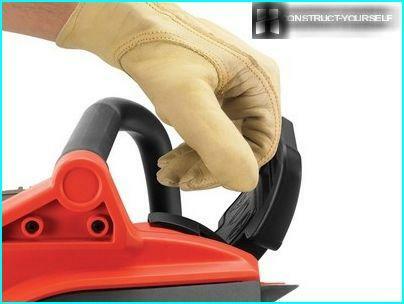 Therefore, the choice of the unit so it is important to protect yourself from possible injury while using the tool. Choosing power, pay attention tothe presence of his blocking accidental activation. It saves you from danger if you do not conveniently take up the instrument with one hand, or after the found that are not yet ready to work with him. 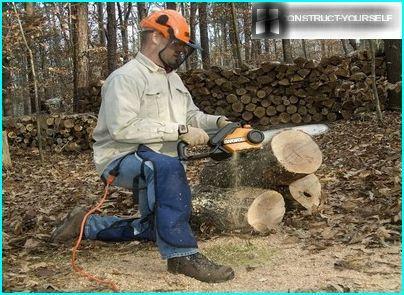 When working with a chainsaw is a special dangerrepresent "kickback." It occurs at the moment of contact between the end of the tire with a solid surface timber, in which the tool is dropped back sharply, and its moving chain can injure the operator. The automatic brake is activated when the hand slips off when there is a "kickback": with pressure plate triggers a spring which includes a brake and stops the chain. tools for repair specialists note thatmost electric chain saws fail in the spring. 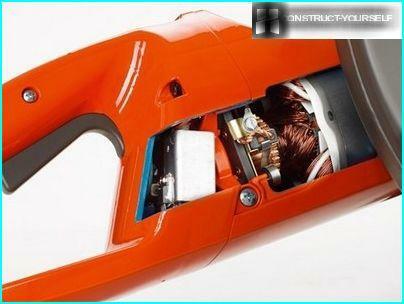 This is easily explained by the fact that during the cold winter months in the tool motor windings accumulates condensate. Drops of moisture and provoke a short-circuit when you turn on the unit. Prevent this problem is to "endure" the tool before starting work in a warm room. To this end, it is put in the room for at least one day prior to the moment of inclusion. Frequent removal tool from the provocateursystem is a voltage drop. By lowering the voltage and the development of the nominal capacity of the unit due to intensive heat generation may just melt the insulation and close the anchor. Therefore, when working with the instrument so it is important to follow the current stability and periodically to give the unit "rest". 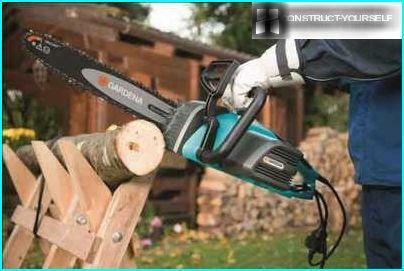 Chain electric saw - simple and easy to use tool. With proper care and compliance with safety rules it will last more than 5 years, without additional costs.